Below is a guest post from a DeKalb teacher, Nikole. This past week’s impromptu winter break has only solidified my stance on a balanced calendar. We need more breaks! I actually would prefer year round school, but it seems that a balanced calendar with an earlier start date and breaks throughout the year, is the closest I could possibly get to that in Dekalb. I also have to admit that I am a teacher and NOT a parent. But I think a balanced calendar is a win for us all. I’m tired. Exhausted. Extremely exhausted. And this break was just what I needed to recharge and make great plans for the next few weeks of school. I work in a challenging environment. My school suffers from high transience, low test scores, and behavior problems out of the ordinary. And that takes its toll on teachers. You lose your passion for teaching in these conditions. Meaningful lessons take a back seat to just making it through the day without incident. It’s just not fun. But returning from summer break always brings a positive outlook. Teachers and students are excited and refreshed. Everyone’s on their best behavior and lessons are phenomenal. We’ve had plenty (I’d say too much because I’m a year round proponent) of time to plan for our kids. Every year, I hope and pray that Dekalb County School Board will give me the time to reboot throughout the year and every year my hopes are dashed by Dekalb County School parents! I’m writing this to beg of you, please, please, please stop voting down the balanced calendar! It appears that teachers and students (those of us actually in schools) actually prefer a balanced calendar. It’s the parents that want to keep it traditional. And why? What is being gained? My teacher-centric view says that happier teachers= happier students=happier schools. I’d like to take this opportunity to address the most annoying excuse for a traditional calendar each year. Child care. I’m not a babysitter! Saying we should keep this calendar so that I can “watch” your kids is demeaning. Further, a balanced calendar does not change the number of days we are in school. Who is watching your kids all summer? Supply and demand suggests that those same institutions will be open during break times that align with the school calendar. And as an added bonus, for all of you that like to travel on breaks- you can take out of season (cheaper) trips. Amusement parks in October offer great weather and cheaper prices. Better teachers, better lessons, better vacations, what’s not to love? Just a few things to consider the next time we vote for a calendar. Readers: This is the opinion of one of DeKalb’s teachers. Please share your own opinions in the comments. This entry was posted in DeKalb County [GA] Board of Education, School Calendar, School Funding, Student Information and tagged DeKalb county school calendar. Bookmark the permalink. I would like to see the public call on the DCSS to move the CRCT dates out by one week given the interruptions in the school calendar due to weather. This will eliminate another potential black eye to our image. As it is now, testing conflicts with Passover and Easter. Who makes this calendar, and why is DCSS so insensitive to religious holidays celebrated by most of their population? Any student’s family wishing to take a holiday for Passover or Good Friday/Easter Monday, or having family dinners into the evening, will suffer. In addition, teachers who celebrate either holiday are not supposed to observe their own religious holiday because these are “critical days.” The entire test including make up days can still be administered in April. Common sense. I don’t ever expect you to watch my children. However, as a parent, I respect your need for a break, but in my nearly decade long expedience as a parent of students in grades 6-12, those little breaks are never a break for the students. Even over Thanksgiving this year, my child had two projects and at least one test the week after break. Virtually, the only break we get as a family is winter and summer. And I am not willing to support a change to more school year breaks for a shorter summer. The reason parents supported the change to an earlier start of the school year, back about 15 years ago or so, was for the same reason. It wasn’t so much the challenge of finals occurring a few weeks after winter break that was the problem. Rather, it was the projects, homework, etc assigned over break. I understand the allure for some of a balanced calendar, but I do have some concerns. Would this balanced calendar conflict with some statewide programs, such as Governor’s Honors or other enrichment opportunities that are only available in summer? If so, then a balanced calender-approach will always get a thumbs-down from most parents. I teach in DeKalb, and I have never given assignments or projects over a break. Early in my career, I worked in a modified year-round school district, and my principal forbade the faculty from assigning work over the breaks, as he was adamant (and rightly so, I realized) that the students needed the break and that we were to give it to them. To be fair, he also encouraged the faculty not to do any work over the breaks either, although that wasn’t entirely realistic for many of us. I don’t see any reason why DeKalb couldn’t adopt the same policy if we were able to shift to a modified year-round calendar (which, incidentally, is fantastic). 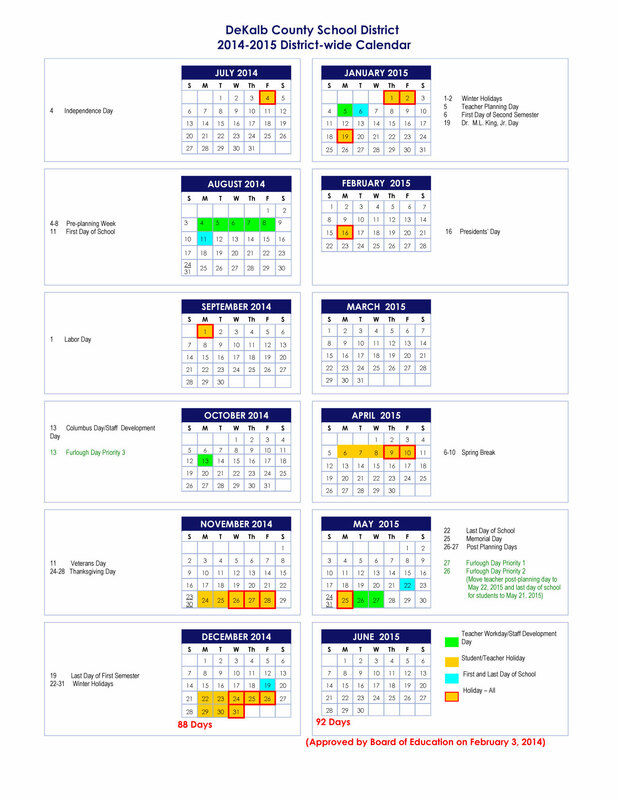 One year several years ago, DeKalb did have a calendar with a February break. We went skiing. It was pretty darn fun and a welcome break! concernedmome30329 – I absolutely disagree with projects over the break. I think it’s okay to give an assignment so that those that want to begin early have it to do over the break, but I don’t think anything should be due back to school when you return from a break. Marsha – Perhaps students participating in special programs can receive school credit for doing them? I don’t foresee this as much of a problem because many metro districts have varied calendars. I know for sure that Cobb, Rockdale, and Decatur City have varied breaks that aren’t on a traditional calendar. DeKalb had quarters instead of semesters until somewhere in the 90’s when my kids were in school. This let us finish before Thanksgiving, then have a quarter with a Christmas break. We never had Spring Break when I was a kid here (50s-60s), just Good Friday off. It was a Yankee thing to have Spring break. We had Snow Days built into the DeKalb calendar and we used them. We still had those for my kids when Hurricane Opal went through one October. I never thought I’d see us use a Snow Day for a hurricane! Somewhere along the line it was no longer the law that you had to attend 180 days of school. Now the legislature wants to allow some school systems to exempt weather days in addition to 10 days of teacher furloughs? My daughter teaches in Gwinnett now. They have eliminated teacher furlough days, and they have Snow Days built into their calendar. They went to school a full day Jan 28, and they went back to school that Friday, when DeKalb stayed closed. They went to school TODAY, President’s Day, to make up for the day at the beginning of school that was too cold to go back. Gwinnett looks like they care about their teachers enough to find the money to pay them for the 180 days, and they care enough to try to make sure the students show up for class all of those days. If I am counting right, they will only be down 4 days for the year without adding days beyond their designated Snow Days. DeKalb will be down 8 days. March is when we have traditionally had our worst snows. I think the county is only run by newcomers who think our recent 10-15 years of warm winters are normal, and missed the Coming Ice Age of 1978. DeKalb should start firing non-teachers until they can at least afford to pay the teachers for the whole 180 days. I was at first sad that my daughter could not get a job in DeKalb. She talked to two principals and department heads at her old school and at the HS she could walk to from her house, and they wanted to hire her, but the head office did not authorize positions until the week before school started, by which time she already had been in her classroom in Gwinnett. And by the way – half her students are on assisted lunch, but they are still a top HS in GA! As a teacher in DeKalb for the past 14 years I have seen some efforts for various schedules in place (i.e. snow days worked into the calendar, the February week off, etc. ), but have never been fond of the year round calendar. I do understand the issues that surround a shorter summer break with the loss of dates for camps, activities, travel, etc., but I also like the thoughts offered by others regarding cheaper travel during “off seasons”, “mental breaks”, and shorter summers. I would certainly think that the “no homework” policy would need to be in place during summer/winter breaks and 3 week long breaks throughout the year (October, February, and April). I work with students who would benefit from shorter summer breaks and more frequent breaks during the year. If this were firmly in place, then companies, camps, etc. could adjust to offer activities during these times as well and educational opportunities would be in place for those who request it as well. I strongly believe it could be done well and I know that many teachers/students also see the benefit of moving in this direction. It would require the stated stipulations, but I would like to see this conversation take place. Each year a new calendar comes out with the normal 11+ weeks of summer break, I think that 7-8 weeks would be plenty and the extra weeks off can be spread throughout the year. Though change is always difficult, I feel this could be a benefit to all–schools and families. Nicole, This is another reason to have smaller one high school with feeder school districts. Local control and choice. What works for your low-income school, does not work for a middle class or higher income school. Parents in those districts relish the opportunity, to have their children off with them. Whether it is to put them in summer camp of their choosing, Boy Scout, Girl Scout, YMCA, Jewish Center, the camp in North Carolina. Send the kids to Grandma and Grandpa for a month or so. Many have custody agreements that send the child or children to the other parent for 6-8 weeks for the summer. Many like to take their children and go to their beach house or lake house. Yes, their are still teachers who teach so they can spend the summer off with their children. Also, professors from the various Universities who do the same thing. I personally, do not want to have a break in October, too cold for Panama City Beach and Destin. Still expensive at Disney as they have learned to keep their rates high for those weeks same thing with Jan. and Feb. week. As a person who supervised over 210 employees in DeKalb county, at one time who did not work for the school system, I simply could not let all employees who had kids in school have the same week off work. It is bad enough with Christmas week and New Years. It just does not work when you are trying to schedule employees who don’t work in the school system with the crazy schedules teachers want. My kids went to Cobb when they did their epic failure of Balanced schedule that lasted one year. Yes they gave out projects and homework, during the breaks. Then every child thought they should go on an expensive trip during this time too. High School students need to have 8-12 weeks in the summer to work and do internships. This is an important part of growing up. With the rising costs of College, they need some chance to save money. They can barely, work in school, because IB and AP teachers have some screwed up perception that they must flood them with projects in High School. My child had less home work in dual enrollment and now still less in her first full year of college ( which is really sophomore classes ) than High School. She still has close to a 4.0. My children deserve a break during the summer. They need something other than school. Life is too short for year round school. For those that have failed their children and want the Free food and the babysitting you want to provide them year round, then it should be limited to those underperforming and on free lunch, but not my children. I agree with anothercomment. I am a parent who had my children in Dekalb County for many years. We have finally transferred to a county that is on a balanced calendar and my children and I all love it! Everyone gets more time to regroup. They are much happier and so am I. They actually learn more and enjoy going to school. Parents you don’t know what you all are missing out on. It is great! I don’t trust DeKalb to do anything right, which is why I don’t trust them to tackle the adjustment to a balanced calendar. I meant to say I disagree with another comment, typing too fast. 😄 Teachers and students need those frequent breaks throughout the year. I have three high school students and they are all A students. Having a balanced calendar gives them time to study, work on projects, work on college prep material, etc..
To @anothercomment: Many of your points make sense. However, I found your last paragraph incredibly offensive. How dare you suggest that the parents of children at schools with challenged populations have failed their children? Not everyone in this country was born with a silver spoon in his or her mouth. How do you know these parents are not busting their butts to be good parents in spite of the barriers they face? Even at your school there are people who are not good parents (educated high-salaried people who had good role models for parents themselves). Every child deserves the same opportunity you want for your children. Then those children can become parents who are better equipped to raise even more children who will be a credit to society. The have/have not attitude reflected in your remarks is a core problem in this country. We need to work together to provide opportunities for every child, not just those who already have the benefit of educated white-collar parents. I am the grandchild of Polish immigrants. Thanks to the efforts of my very caring, uneducated, widowed mother who worked nights to raise us 4 kids right, I have two masters degrees and have had two successful careers. I would not call her a failed parent, but you, looking at our situation back then might have done so. Considering that we lost between 800 to 1,000 teachers last year, teacher retention should be the highest priority for the academic progress of DeKalb students. Highly qualified teachers are the MOST important component for students. Involved parents are extremely important, but student needs for high quality instruction cuts across all income levels. Teachers are the personnel who deliver the content of math, science, social studies and langauage arts that students must master to ensure they have the best opportunity to become self supporting adults and informed citizens. If a balanced calendar helps retain the highly qualified teachers who are fleeing our classrooms in droves, and is in the professional opinion of most teachers, a component that will give our students a better opportunity to master content, then that should be the major factor in creating the school calendar. The school calendar should maximize learning for students. There are a number of other important components that are necessary to improve student achievement such as highly qualified teachers, reasonably sized classrooms, and access to cutting edge science and technology equipment and supplies. Believe it or not, there are schools and school systems in the U.S. and even in Georgia that offer these components so necessary for ALL students to succeed. Unfortunately, the DeKalb administration has not involved the professionals who instruct the students in the content that must be mastered in the decision making processes. Parental support for teachers cannot be overstated, and an enormous part of this support is respecting their professional opinions on what is the best learning environment for their child/children (our most valued and loved person/people in life no matter what their income or educational level). Remember that the children share the teacher’s environment and vice versa. No adult is a greater proponent of a pleasant and productive learning environment than highly qualified teachers. If we want to attract and retain highly qualified teachers, parents and the DeKalb administration need to rely on the advise of these personnel. You can’t have it both ways – expect to have highly qualified teachers and leave them out of the decision making process. It doesn’t work out well for students. Unfortunately, if DCSD is conducting the teacher survey, we cannot trust it. I have heard many stories of surveys being sent out, resent out, and questions as to which employees were allowed to complete the survey. Given that we have more support staff and admin than we have teachers, we can’t know for sure if the survey results were true or false with respect to teachers. My inclination is to think that DCSD, under Atkinson, said the results were whatever they wanted them to be (balanced). The current administration has not proven themselves to be trustworthy, either, with the way they brought their opposition to DHCC at the last minute. In addition, even if the breaks were put into place with the understanding that no projects or homework should be due immediately upon return, we all know that would happen anyway. Here’s what I said n the survey…enough already. Can we please discuss more important issues in this county. It is clear the parents DON’T support a modified balanced calendar, a balanced calendar or anything resembling such. MOVE ON DCSS. Now, I believe the bottom 3 elementary school, bottom 2 middle schools and 1 bottom high schools should move to a year round school. These schools are definitely in need of this intervention. Why is it now that when a small percentage of our population is in need of change, the entire system must be upended to suit. Nikole work to fix those schools who truly need to be in school year round. First, go to their PTA and suggest the parents get behind your initiative to change their school year. Second, get the principal, counselors, etc and round up the teachers who would like to serve at a year round school all behind you as well. Third, take your entire initiative, teachers, parents, admin and present this along with the studies you have researched to the BOE. Just to watch them vote it down. It’s just EASIER to make everyone change to suit the needs of a few. The real changes that need to be made are not supposed to be easy. These schools should get the advantages of having more consistent educational time. It won’t happen because it is not the status quo and there is no vision in DCSS, it is all lip service. The people in charge for the last 12 years have made choices that our kids are paying for over and over. Nikole, you nailed it! I,too, went back today rejuvenated and anxious to work with my kids. All of my papers were graded, I had plans for the next two weeks, and I felt great. Thanks for defending the balanced calendar so effectively. The school superintendent is going all over the media bragging about all the schools being wireless. Well, they may be, but the internet just does NOT work. Cannot even show educational animations , let alone have video streaming or have students use the internet for research efficiently. I used to be able to count on showing several clips, animations, brain pop, whatever, in my lessons. I have had to take a decade step back in time with my lessons because anything in my presentations that rely on the internet just cannot load. The stock answer from IT has been, when you get a new computer it will work. Well, what about the room full of students sitting there today waiting to be educated? Is Michael Thurmond and the school board okay with that answer for this year’s students? The survey I mentioned earlier was in regard to the calendar survey sent out a few weeks ago. Today, after a week off, my kid’s science class consisted of taking a survey on her teacher. One student couldn’t get it together, taking too long, and the rest of the class period was spent doing nothing. What the? And Chamblee High Lost the Afternoon to a kid that was suppose to be on ISS, but instead slipped away. He broke into the man’s house behind and stole three dufflebags of guns, TV’s and other electronic. On the 11:00 news the man, states he repeatedly told the school district that the students, were cutting his fence and skipping classes though his yard that backed up to the high school field. He knew it was only a matter of time before they broke in. Well this kid found the motherload of guns in the house. He made the big mistake of hiding them back on school property. Now tommarrow Wed. will be another lost Educational day, at Chamblee as the students will discuss on and on. Media hound Supt. will know the press with be there. So Thurmond will somehow show up at noon to stage a presser, of what a great job his School Security Guard did, calling Chamblee police and capturing the said student. However, the question remains, why wasn’t this kids parent found when he was absent from ISS today. The parents say they dropped him off in front. Who takes roll? Who makes sure the kids are in SSI? I don’t look at the school as a babysitter. I have a special needs child who thrives on routine. At least one day before and often the day after any break the schedules change and often time is lost on instruction. The lack of routine in the school day and the random time off makes my child anxious and he loses ability to focus on learning. In addition, many parents and some teachers will take time off surrounding any break thus increasing the loss of educational time. There is no evidence to support that a balanced calendar increases student achievement. I can tell you that it certainly does not help my child. A few comments were deleted due to the tone. Please make your points without name-calling and bullying. This is a civil discussion, not an episode of Jerry Springer. @anothercomment: I have to disagree with you once again. Have you ever been a teacher? If not, your opinion on Nicole’s need for a break is worthless. On the other hand, I spent 10 years teaching first grade and at least 12 years of my Navy career supervising/leading subordinates. I am qualified to say that teaching children is nothing like supervising adults. I suggest you do some volunteer work in your child’s school. it may give you a clue on how exhausting teaching is; the load that has been dumped on teachers in the last 7 years is absurd. I applaud the teachers who used their time off to do school work; that shows just how much they care about the children. Nicole and others like her do not deserve to be called whiners. She isn’t whining; she is pointing out a way that will enable her to be a more effective teacher. @anothercomment: Your post was incredibly offensive and inaccurate. Just because many families can’t afford pricey vacations and camps doesn’t mean that they want food stamps and free babysitting for their children or that we should do something different (your implication being less) than what we do for schools in higher income areas. Most families bust their butts to do the right thing for their children – low income or high income. Rather than actually addressing Nikole’s post, you chose to bash her and her school. She is proposing a viable solution. As a a Dekalb County schools parent, I am in complete favor of year round schooling with a shorter summer and more frequent breaks. And to go even further, I am totally in favor of extending school contact days from 180 to 200 days and increasing teachers’ salaries to attract the best and the brightest to teaching. My bottom line is that I want my children to have a high quality public school education period. If that means that my children are in school longer, classroom sizes are smaller, there are more teachers and those teachers get enough time and energy to teach, then so be it. Education is my priority, not whether my children can get to Disney World. They can go to Disney World on their own dime when they are highly paid professionals because they had a good quality education. Grow up and stop whining about your privileged lifestyle. Thank you, dekalbschoolwatch, for removing the negativity as I am sure there would be more from others to follow. It is clear that Nikole was simply stating her opinion. I never cease to be amazed at the hostility some can have toward someone’s opinion. I am one who supports a balanced or year long calendar for the students I work with (low income, free lunch, refugee students). If I had children or worked at another (“easier”?) school I might feel differently. However, I totally understand the arguments on both sides of the debate, here and in other arenas as well. Many teachers are dealing with very slow internet issues. Apparently ESIS, the ridiculously poor online attendance and grade book program, is at fault. Since ESIS requires Explorer 7 (2007?) as the browser for it ricketty JAVA software, no one can update their Browser…seriously, teachers see prompts to upgrade Explorer, but cannot since Java/said need a SLOWER browser…. Because ESIS, which is an expensive joke (cannot display full names or Entire classes, counts one absence as two, requires complex Prep and Strand nonsense)– since ESIS needs JAVA and Explorer to stay in 2007 mode, most teachers desk computers are about as fast as 20th century dial-up systems, and anything like YouTube or BrainPop will just crash…cool, huh? Wow, anothercomment, a bit snarky toward Nikole, don’t you think? I have previously commented that you are obviously not an educator because you think Nikole is whining when she is merely stating facts. If you experienced even a small slice of our week, you’d see that it is exhausting, and small breaks here and there would be restorative. We teach because we love it, but that shouldn’t mean we can’t point out faults and how to make things better. Those of us in favor of a balanced calendar aren’t requesting less working days, just that they be arranged to be more effective. I appreciated having time at home last week to catch up. However, I don’t think adopting a year-round calendar is the solution to the high stress and crushing workloads that teachers are experiencing. Teachers are paid to work a specified number of days a year. If you are scheduled for a week off, it would be nice to be able to rest and relax. How many teachers spent last week grading papers, planning lessons, or doing something to make this week easier? If you did school work, you really didn’t get a break. You got a change of pace. That might get old fast when you are using unpaid, personal time. I prefer the traditional calendar. Yes, there are children who benefit from a longer school year. That should mean more instruction. The calendar we are discussing has the same number of days as a traditional calendar. This doesn’t help the child who needs extra instruction. A traditional calendar leaves time for a real summer semester. Four to six weeks of school that will help children work on skills they need to move ahead. It is enough time to keep many children on track with their peers. Let’s not kid ourselves, there are children at every school in DeKalb who would benefit from a summer semester. Of course, we would need to be able to pay for those extra instructional days and we still have furlough days on the calendar. Perhaps an option to a balanced calendar that would give teachers the time to do their job without so much pressure, would be to offer lower class sizes, less paperwork for central office, more support staff like paras and a planning hour every day. Pie in the sky? Unaffordable? I really don’t think so. It’s just a matter of priorities. If leadership determines that these things are important enough, they will fund them first – and then build additional programs and admin staff around what is determined to be core to learning. I agree with you @DSW, a balanced calendar wouldn’t fix a thing for teachers. Real changes need to be made and this seems like moving the chairs on the Titanic. I don’t want a break to catch up on my work. I would rather get those paid planning days back. Coming in to my classroom to plan and collaborate without students there would make me much less stressed and refreshed and prepared than starting earlier in the summer. Are there issues with Fernbank? Heard a snippet on the news but didnt hear the story. Maybe design? Something about the lack of space on lot, parking, play area, retaining walls? Anyone know? esis stinks, but it is not the problem; the students have hacked into the wi-fi code. It is impossible to use the internet for classroom presentations because the wi-fi is overloaded with kids texting, playing online games, web surfing, etc. To make sure if this was for real, the other day in the media center, I asked a student if she knew the wi-fi code; she did, and so did about 5 other students in the room at the time. They called it out as easily. That is the real drain on the school educational internet. It takes forever for anything to load because the kids across the county are clogging up the wi-fi. @decatur teacher…wow. That’s a HUGE problem. @Decatur teacher: Yes, the new wireless password is out in the high schools and I figure the students are “highjacking” the Wi-Fi. I am not sure how it happened… Adults trying to be “hip” and sharing with the students or just the “innovative” students figuring it out for themselves, but it is certainly out regardless. I think now that we are 100% they need to move to a new password to get it back under control. The issue is they’d need to get in every school again and reset the laptops, ipads, etc. I certainly don’t think DeKalb is prepared to go full out “bring your own device” yet. Though that may be a future aspiration, they do not have the bandwidth to support it yet. Should be interesting how this plays out…. I am in an elementary school full of kids with very few devices or opportunity to use them. Our internet is slow as can be. I can rarely get videos to download. My student computer won’t do even basic sites that have graphics. They came in the other week and unplugged my two oldest computers and told me that we are getting newer ones (not new but newER), I have one useless student computer. Technology is a joke still. I get mad every time they brag about being 100 percent wireless; without the bandwidth this is meaningless. There are many, many ways to secure wireless networks beyond simple password protection. There are many available texts on this subjects, many software packages available (many very inexpensive), and dozens of experts/consultants some of which reside in State-supported colleges and universities and even some very talented undergraduate and graduate students who would probably be more than happy to assist. Those networks should be secured and soon! They risk viruses that threaten the network, programs, databases, and people, to say nothing of the personal information that is at risk. I had first hoped that these networks had been secured – that goes with the territory when designing and implementing networks. Guess not! The Georgia Forestry Foundation invites you to participate in a statewide contest to express the value of our sustainable working forests and what they mean to you through submission of artwork with a slogan. Schools that participate in the statewide contest will have an opportunity to win a prize valued up to $35,000. One winner will be selected from each level. Each winning entry will be awarded a prize valued up to $35,000, which includes a $15,000 cash award to the school, $2,500 cash award and forestry camp scholarship to the student, Project Learning Tree environmental professional development for up to 20 teachers and an invitation to attend the Georgia Teacher Conservation Workshop for two teachers from the winning schools, a field trip for students in the grade level of each winning student, and materials featuring the winning artwork and slogan. Also, the winning students, their parents or guardians and two school staff members from each of the winning schools will be invited (expenses paid) to attend an award ceremony on Sunday, July 20 at the Georgia Forestry Association’s Annual Conference in Hilton Head Island, SC. Full description of the prize package can be found in the contest terms and conditions found in the contest details.